Size Three (in snaps only) now available here. The snap version is here: Thirsties Duo Wrap Snap. This cover has rise snaps. 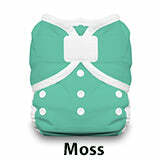 I think the size change from size one to size two might come at 15 pounds not the 18 pounds recommended but baby shapes vary of course, so weight recommendations are always a rough guess. Great over unpinned prefolds. 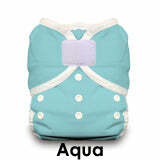 Size one fits over newborn orange edge or novice green or small yellow edge prefolds. 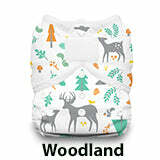 Size two fits over medium red edge, intermediate blue edge or size large brown edge Cloth-eez prefold diapers, trifolded and just placed in the wrap. If you need a cover to fit over size XL toddler prefolds, then you need the Thirsties Cover in Size Large or the Duo Wrap size 3 instead. 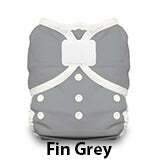 This is a no-pinning delight, but you can fasten the diaper underneath. 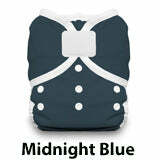 They also work very nicely over Workhorse diapers and other fitted or fastened diapers, too. 100% polyester with TPU laminate FREE of VOCs, PVC, phthalates, lead, and latex. Made in the USA. These covers fit my lean, 26 pound two year old very well. 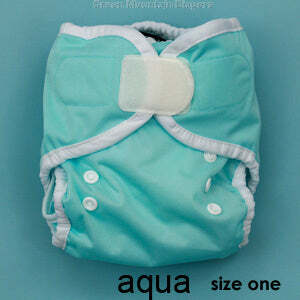 One of my favorites to put on her, and they're still on the smallest rise so they will last her through potty training. They don't fit my chunky 3 month old as nicely, but they have never leaked for him, just looks extra bulky. And such cute prints! 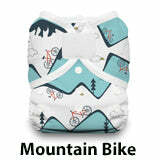 Love this diaper cover. It is very easy to put it on. 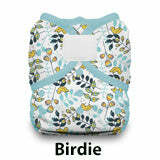 Great cover for fitted diaper! We LOVE these covers! I have a 2 year old (big boy with chunky thighs) currently in a size 2 hook and loop. 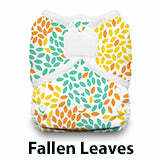 We use Alva Bamboo fitted diapers underneath them and have no issues with leaking. With the fitted on, it is bulky so I was extremely happy to see that this cover still had wiggle room!!! 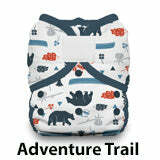 Love these wraps...only need two sizes from birth until potty trained. 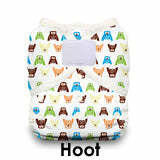 I love these wraps because you only need two sizes from birth until potty trained. 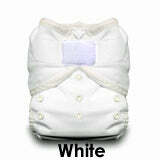 I recently purchased size two for our baby because she was growing out of size one. My only complaint is the snaps in the front to adjust the rise of the cover sometimes come unsnapped while putting the cover on.They are hard to resnap once on a wiggly baby.